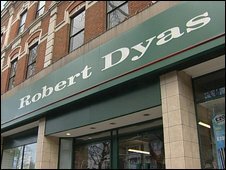 High Street retailer Robert Dyas is to be bought by its senior management in the next week, the BBC has learned. It will not be going into administration as had been suggested in weekend newspaper reports, according to Ian Gray, a Robert Dyas executive. But sources close to the current owners have said that it will not be a management buy-out because the banks will effectively be taking control. Robert Dyas employs 1,250 staff at its 99 electrical and hardware stores. Sources estimate that the retailer had debts of £30m. Newspaper reports suggested that last-ditch talks were underway between the current owners, Change Capital Partners (CCP), and lender banks led by Lloyds Banking Group. The Sunday Telegraph quoted from a letter sent on Friday by Roger Holmes, managing director of CCP, to Eric Daniels, chief executive of Lloyds, accusing the banks of refusing to negotiate over reorganising the debts for the past seven months. It also quoted a statement from Lloyds saying: "We are supportive of Robert Dyas and are working with the management to ensure that the operating business continues to trade profitably." CCP is a private equity group led by the former boss of Marks & Spencer Luc Vandevelde. Executives at Robert Dyas told the BBC's Joe Lynam that the company has been trading profitably so far this year despite the slowdown on the High Street and that it had benefited from the demise of Woolworths.